The developments presented in this chapter are results of a new research project, “Reconfigurable POEtic Tissue”. The goal of the project was the development of a hardware platform capable of implementing bioinspired systems in digital hardware. 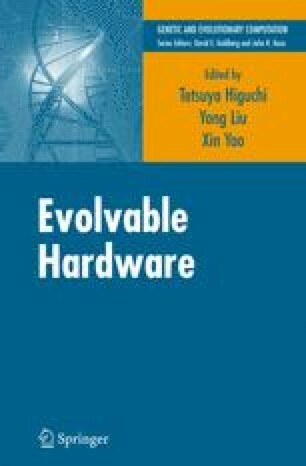 In particular, the final hardware device, while similar to other FPGAs, was designed with a number of novel features which facilitate evolution, development and learning. These include dynamic reconfiguration and on-chip reprogramming. This chapter gives some details of the architecture of the device, followed by a simple example. The example considers these features available on POEtic in the context of fault-tolerant system design and shows how an ensemble of different, but often complementary, techniques might be produced using these novel device features. It is argued that these features are generic for many evolutionary-type applications.